One of the things I love about user experience design is that it extends so far beyond the page or phone screen. User experience exists in everything with which we interact on a daily basis, and impacts our lives more than anything else I can think of. While I assume the park planner carefully designed that path for the best user experience, the beaten dirt path shows that the planner failed in this goal. Nothing displays what the user needs more than a visual sign of how the park is actually being used. And while I'm sure the planner had good intentions, enough feet to make a dirt path as defined as this one can't be wrong. But these examples unfortunately only exist in natural areas that can be shaped by the common folk who use them. What about solid concrete? How do we know when an area has been improperly designed that is used more often than a park? 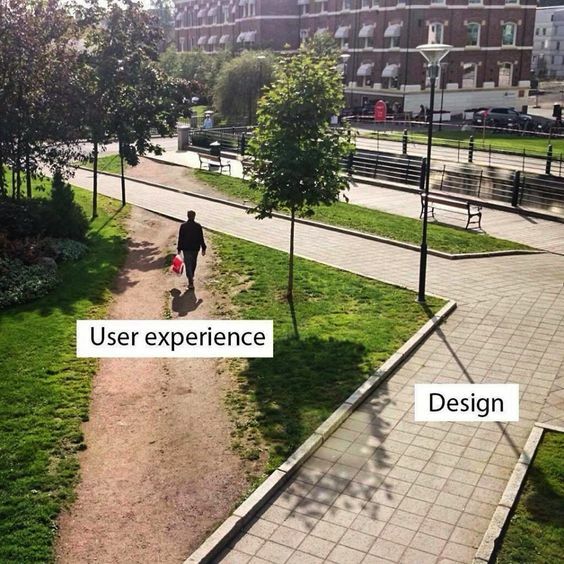 Unfortunately, most of us in this first world of ours come into more contact with designs that are decidedly much harder to shape through use than a park path. Take city streets and sidewalks for example. If I were to walk on the street (say, because the sidewalk concrete was in bad repair or too narrow), I would not be able to shape my use into something visible. Even as many feet as had shaped that park path wouldn't cut it. So where does that leave the average user in terms of shaping their experience to fit their needs? Piles of snow can work like city planners, revealing the path to better road design, say advocates. In the white space that sticks in intersections, untouched by cars after a snowfall, they see bike lanes, wider sidewalks, and tree-filled traffic islands. The snow piles are dubbed “sneckdowns,” a combination of “snow” and “neckdown,” a technical term for traffic-calming curb extensions. Of course, while this is a natural and elegant answer to the problem outlined above, it is only as good as the snowfalls of the season. There isn't really much to be seen of sneckdowns in the summer months, ironically when that space could be used most. That said, a skilled urban planner could surely see these design faults without need for a winter snowfall. On a positive note, think of all of the potential for the unused areas in these sneckdowns. I have seen some excellent restaurant patios that edge onto the street, filled with greenery on an otherwise very drab landscape. Or how about some covered bicycle parking, or just a really nice bench on which to sit and read a book? The possibilities are truly endless.